The undead get animated when Adult Swim’s The Robot Chicken Walking Dead Special: Look Who’s Walking arrives on Blu-ray and DVD on March 27. From Robot Chicken creators Seth Green and Matthew Senreich and their Stoopid Buddy Stoodios partners, John Harvatine IV and Eric Towner, along with The Walking Dead creator and executive producer Robert Kirkman and showrunner and executive producer Scott M. Gimple, the 22-minute special is a hilariously brilliant parody joining together two fan-favorite television series. The all-star lineup in this horrifyingly hilarious special includes The Walking Dead cast Andrew Lincoln, Norman Reedus, Jeffrey Dean Morgan, Danai Gurira, Melissa McBride, Lauren Cohan, Steven Yeun, Sarah Wayne Callies as well as Nerdist Industries CEO and Talking Dead host Chris Hardwick and Breckin Meyer (Rat Race, Road Trip). Highlighted by exclusive commentary from Gimple, Green, Kirkman, Senreich and director Tom Sheppard, The Robot Chicken Walking Dead Special: Look Who’s Walking Blu-ray and DVD collections will also feature a behind-the-scenes look at the making of the special. Following the successful releases of Robot Chicken: Star Wars Specials and Robot Chicken DC Specials, Adult Swim’s release of The Robot Chicken Walking Dead Special: Look Who’s Walking provides fans with even more of the series that has garnered a cult-like following since its inception in 2005. Featuring provocative sketch comedy, the series has received acclaim from critics and fans, alike, with its clever pop-culture parodies and the unique use of stop motion animation of toys, action figures and dolls. The Robot Chicken Walking Dead Special: Look Who’s Walking Blu-ray and DVD will retail for $18.94 SRP and $14.97 SRP, respectively. 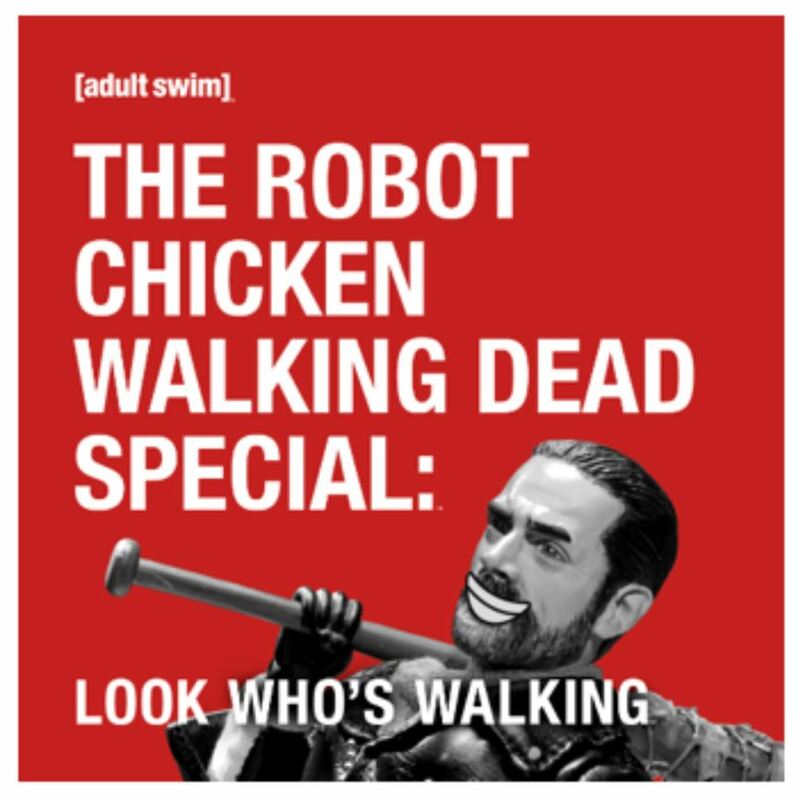 In anticipation of the DVD special, Adult Swim will release the The Robot Chicken Walking Dead Special: Look Who’s Walking soundtrack on Friday, March 23 featuring four tracks from the special. The digital album will be available for purchase in digital music stores including iTunes, Google Play and Amazon, as well as on all major streaming platforms including Spotify, Tidal, Pandora and others. Adult Swim is part of Turner, a Time Warner company, is a global entertainment, sports and news company that creates premium content and delivers exceptional experiences to fans whenever and wherever they consume content. These efforts are fueled by data-driven insights and industry-leading technology. Turner owns and operates some of the most valuable brands in the world, including Adult Swim, Bleacher Report, Boomerang, Cartoon Network, CNN, ELEAGUE, FilmStruck, Great Big Story, HLN, iStreamPlanet, Super Deluxe, TBS, Turner Classic Movies (TCM), TNT, truTV and Turner Sports.